The rain poured steadily during the first part of our drive, as we passed two massive kelpy (a mythical horse that lives at the bottom of the lochs) statues on our way to Doune Castle. 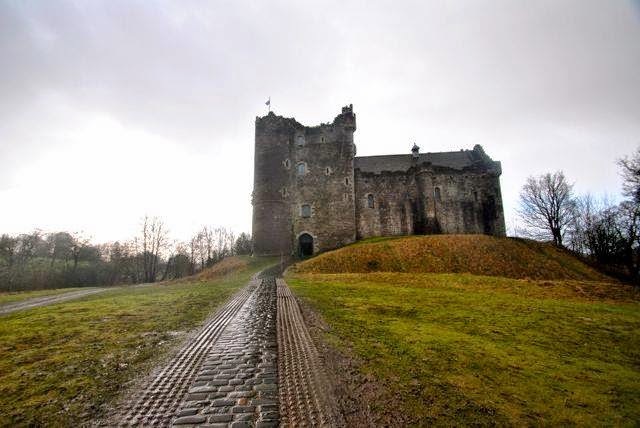 Sarah and I had been particularly excited to visit Doune, as it was not only the filming site for Monty Python and the Holy Grail, but it's also being used for the filming of the Outlander TV series on Starz (and was also used for Winterfell scenes for Game of Thrones). 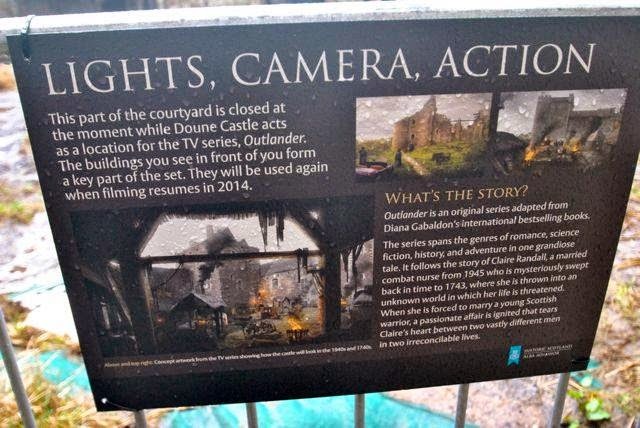 And, to our great delight, the Outlander set was still in place in the courtyard! The castle wasn't very large in terms of the footprint, but it rose a number of stories high, and we took our time weaving our way through the various rooms and alcoves with the assistance of an audioguide, as much as we could in the time allowed. 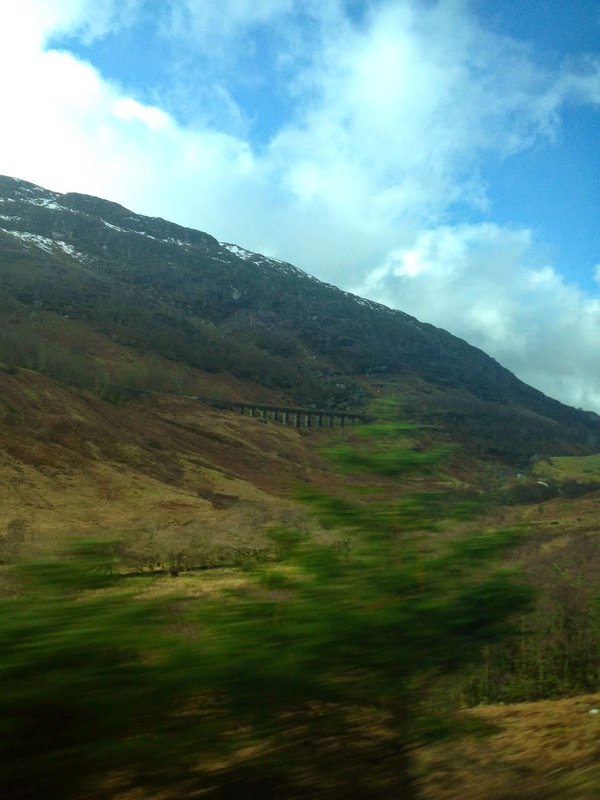 Back in the bus, we made our way into the Highlands and its stunning scenery. Sarah observed that it looked like a cross between Appalachia and New Zealand - there were stony mountains, tall pines and leaf-less trees, long grasses blanketing the hills like a fur coat, and bushes dotting the landscape, in every shade of green imaginable, in vibrant tones enriched by the rainfall. A few of the hills were capped with snow, and black-faced sheep grazed alongside much of the road in large, sprawling pastures. Donald took us on a couple of brief stops and detours - first to Loch Lubnaig, a massive narrow lake shaped like a boomerang with ancient mountains in the distance, then to a narrow bridge over an expansive river, flowing over and down large rocks, around earth and trees, creating a beautiful section of rapids called the Falls of Dochart. Nestled next to the falls sat an old burial site for Clan MacNab. 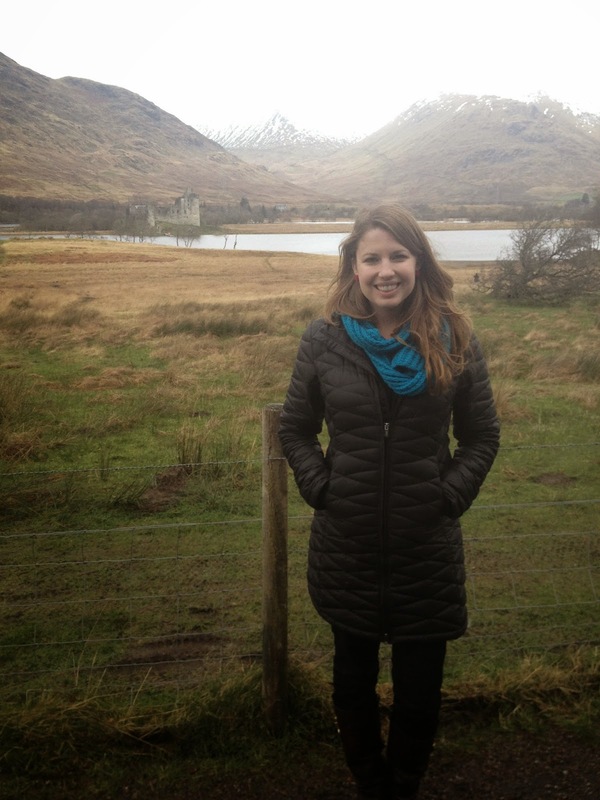 Our final stop before lunch was at Kilchurn Castle - a large castle situated on a strip of land in the middle of a lake, visible from afar. 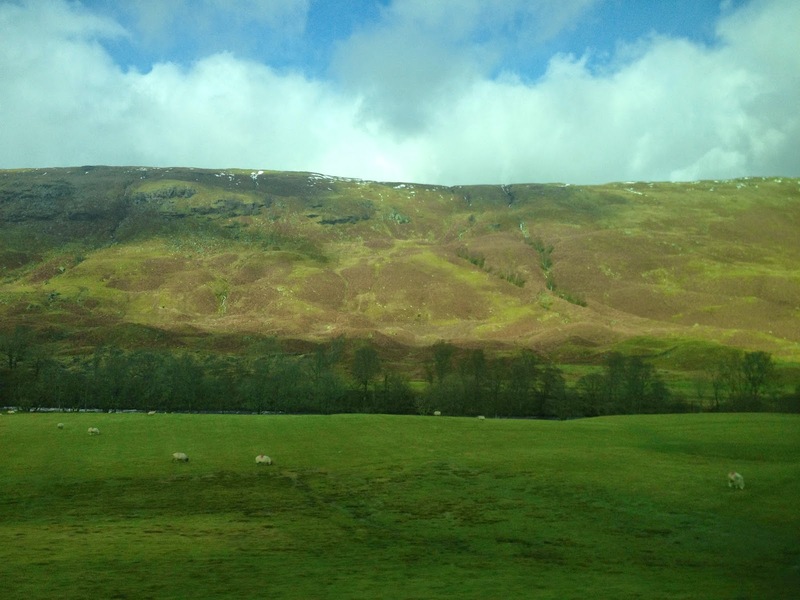 After a quick stop for a cafeteria-style lunch, we continued our drive through the incredible scenery, enjoying Donald's stories and interesting facts about the Highlands, as well as the Scottish music playing in the background. 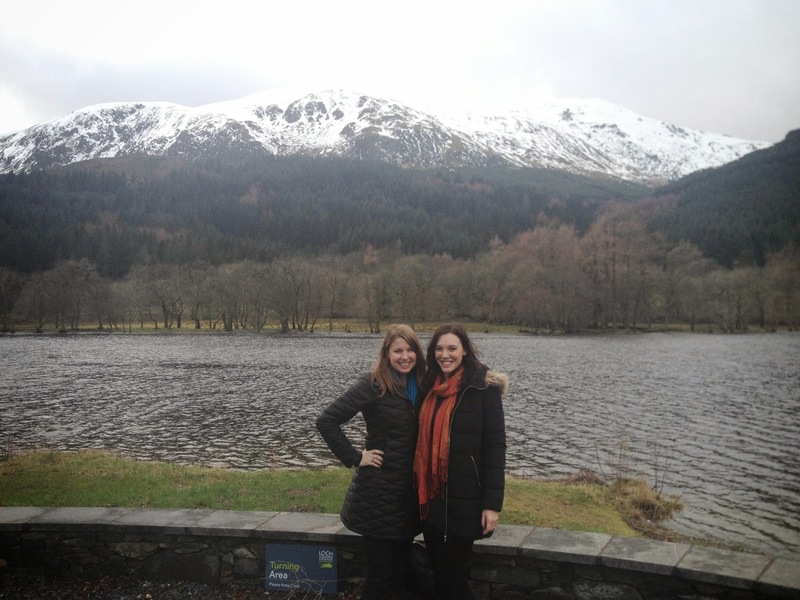 Our next stop was Inveraray, home to Inveraray Castle, the seat of the Duke of Argyll, head of Clan Campbell. Unfortunately, the castle was closed for visitors during the winter months, and a steady rain was falling during our stop, so Sarah and I hid out in a local cafe, enjoying warm, freshly baked scones. 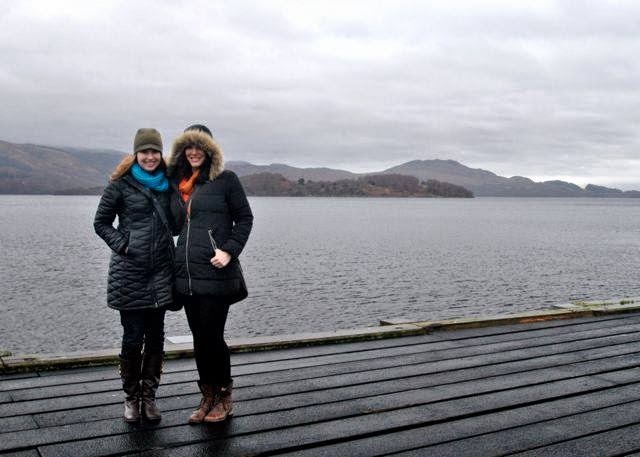 We listened to more tales as we made our way to Loch Lomand next, watching the green fields and forests pass by, blanketed in soft grey clouds, enveloped by winter. One of the interesting tidbits Donald shared with us was the origin of the word "blackmail" - Rob Roy, a Robin Hood-like figure in the Highlands, was known for stealing cattle, a valuable resource in those days, from rich landowners. He started charging a fee to "protect" (ie, not steal) cattle, which at the time, were typically black. Money at that time was called "mail", so the fee paid to keep Roy from stealing the cattle became "blackmail"! A side note - those same Highland cattle are now typically a reddish color, covered in sheepdog-like shaggy fur, and both the males and the females have long horns. We happily spotted a few grazing not too far from the road along our route, though not quite close enough for a good photo! We took a long break at Loch Lomand, perfect for wandering and exploring the area around the lake. 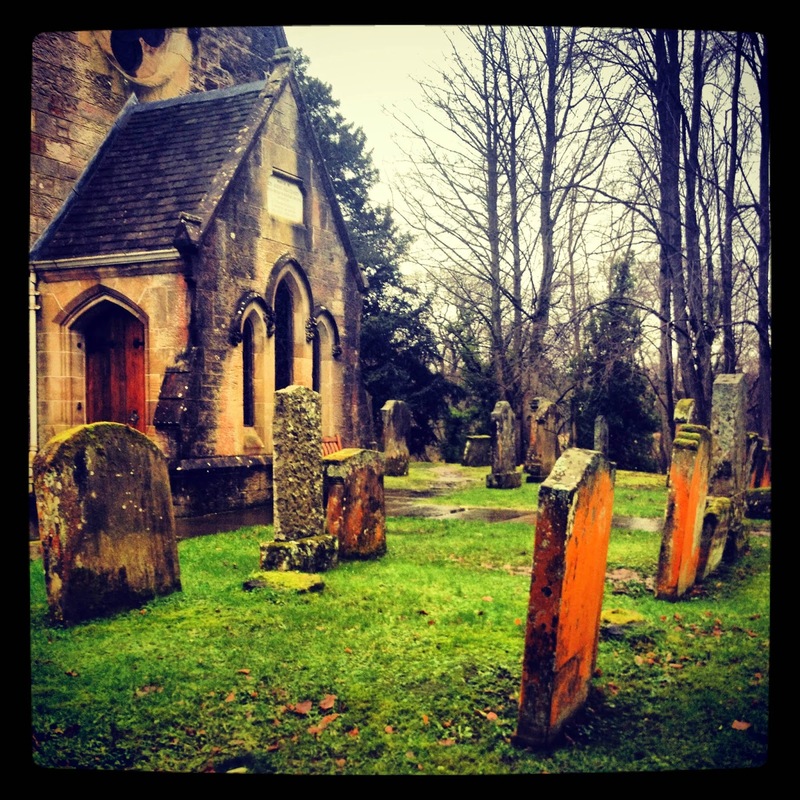 Sarah and I stumbled across a small, ancient moss-covered stone church with a small green and stone kirkyard, the gravestones covered in soft green and orange lichens. Coming up to the lake, greeted by ducks and swans, we took in the massive expanse of the water in the frigid air, enjoying the gorgeous surroundings. 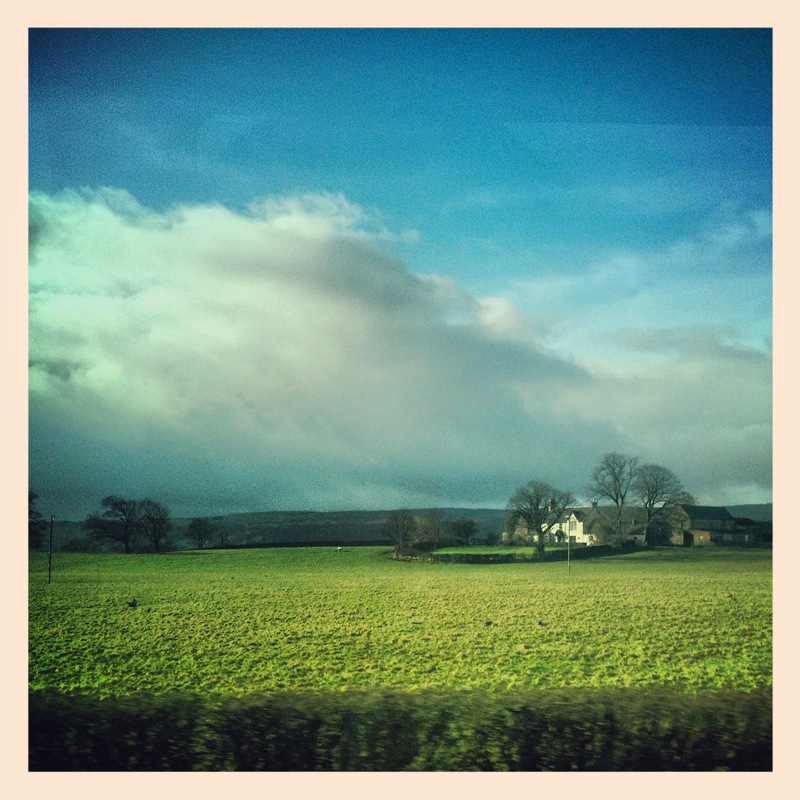 Back on the bus, the light began to fade as we headed back towards Edinburgh, but Donald managed to give us a few bonus stops along the way. As we passed Stirling, he drove us up to the castle, which was itself closed, but we had a fantastic view of the town below perched from our vantage point on the ancient volcanic rock that the castle sits atop. We also passed statues of William Wallace, Robert the Bruce, and an unnamed kilted soldier. As we neared Edinburgh, we made one last pass through an area called Queens Ferry, taking in the view of the the Forth Bridge and passing a hotel that is the setting for a Robert Louis Stevenson novel ("Kidnapped"). Donald dropped each of the tour members off in various spots around Edinburgh, with Sarah and I departing last only a block or so from her flat. As it was my last evening in town and Donald had just been telling us about haggis, we decided to give it a try, picking up some haggis and chips to go from a nearby diner. And the verdict is: pretty tasty! We were a little disappointed that we hadn't tried it earlier!